Daisy Brand Vintage Orange Crate Label, Covina Orange Growers Assn, Covina, California. Image of a bright daisy on black background with sunkist orange in bottom right hand corner. Daisy Brand Vintage Orange Crate Label. 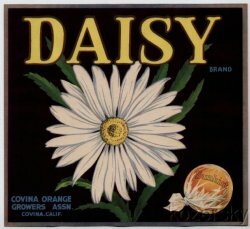 Original Daisy Orange Crate Label, Covina Orange Growers Assn, Covina, California. This original, mint 1940s label measures 10x11 inches. Image of a bright daisy on black background with sunkist orange in bottom right hand corner. Can be framed. Bright, vibrant colors.